Hi all, I'm back.. ish. I've continued to fall off the blog wagon, and honestly, I do feel bad about it. I really enjoy(ed) posting my recipes and restaurant visits, etc. up here, and I have recived a ton of positive feedback from all of you. And plenty of requests to keep GVK going. However - and I can speak freely because this is my blog, darnit - I don't know how regular bloggers do it. I read a LOT of blogs, but as for writing, man, sometimes it's tough. I don't know how people write every day, or close to every day. Most times Sometimes, I just don't feel like it. Haha. But the ones that are dedicated, they have some great results. And I want to be like that. So, after a talk with E (my number one supporter), and some internal soul-searching, I'm deciding to re-vamp the site and have a "grand re-opening" in 2012. Perhaps not Jan 1st (too hungover), or really anytime immediately after. But, it will be soon, after the holidays have passed, and things get back to post-Christmas normal. But I am dipping my toes in the water yet again. And it feels good. Baked Eggplant Parm : Classic, reduced-fat, and really busting with flavor. You'll be amazed! Chocolate Caramel Trifle : The perfect dessert for a party. Your guests will be raving - that's a guarantee. Lobster Mac and Cheese : The perfect blend of comfort food and elegance. Chicken can easily be a replacement as well! If this is your first time visiting Girl Versus Kitchen, welcome! Follow me, and stay tuned. I am always, always open for suggestions and guest posts. Leave a comment or two! I posted the following picture on my Facebook page﻿ and recieved rave reviews on how good it looked. It's the beginning of December, and the perfect time to bust out the slow-cooker. After a long, cold day of working, Christmas/Hanukkah/Festivus shopping, or just being out in the winter weather, nothing warms the soul like a big bowl of.. this. Nothing beats having dinner already-ready for dinnertime. A nice change from the regular beef-and-red-bean chili my dad someone in almost everyone's family makes; it's low in fat and calories, even if you do decide to garnish it with sour cream and cheese, it's only an extra 70 calories more. Let me know if you want me to include the nutrition facts - if that is an interest for my readers I'll be happy to do it! Throw everything into slowcooker and give a stir to blend ingredients. Put on "Low" for 6 hours or "High" for 3 hours. Afer this time has passed, remove chicken pieces with a slotted spoon, put into a large bowl, and shred the chicken with two forks. Put chicken back in and put on "Low" for 30 minutes. 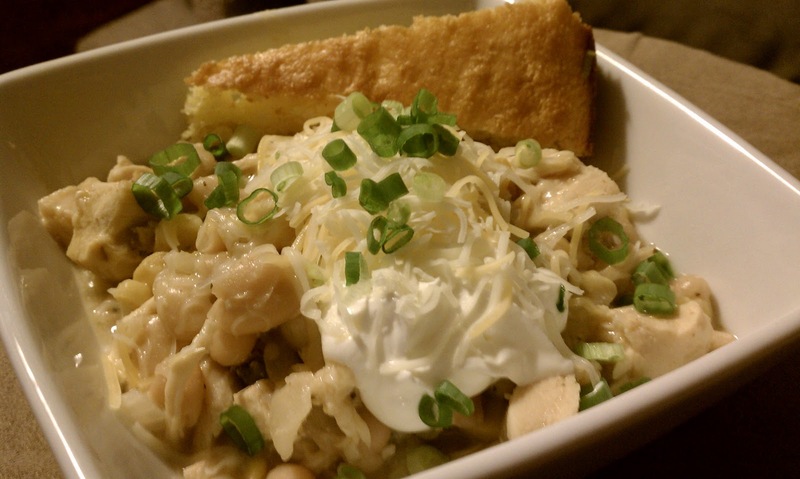 Ladle into bowls and, optional, garnish with sour cream, shredded cheddar/pepper jack cheese, and diced green onions. Serve with fresh warm cornbread and a veggie on the side! SERVES 6 to 8. Freezes well.